Monday mornings are for smoothie bowl creations. Okay, not really, but this week it [Monday] is. 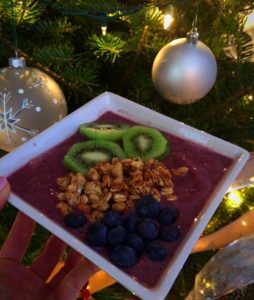 Smoothie bowls are SO pretty and trendy. And, while I could pretend I make them every day, I don’t [ezekial toast, almond butter and banana is a more convenient pre-run snack]. But, I made a rainbow bowl this morning as I was avoiding the planned long run in the less than happy temperature. So, I figured I would continue the procrastination, keep my fingers crossed that the sunshine warms things up even a couple of degrees and document this creation and my thoughts. [Yes, you are welcome]. Just for the record, I will also run with Jesse later today. Let’s break down my smoothie bowl. You will need a blender, a few nutrient-dense ingredients and about 5 minutes [not inclusive of consumption]. In this house, it’s always about fueling for [everyday] performance, so we talk about the nutrients over the calories. That’s why I moved the smoothie from the blender cup to a big bowl – more room for treats [nutrients]. Combine the smoothie ingredients [frozen berries, EXTRA ice, water, shake mix & Ionic Supreme] and blend until thickly, smooth. Pour into a bowl. 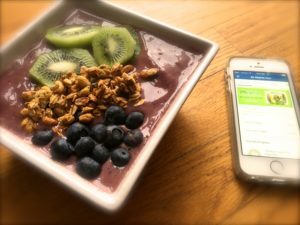 Top with your favorite smoothie toppings [kiwi, blueberries, granola]. For the most yum, grab a spoon and serve IMMEDIATELY. This rainbow bowl of goodness is the perfect performance fuel. Nutrition by the spoonful – vitamins, potassium, fiber, carbs, protein – it’s all in there. Don’t forget the kiwi – this is kiwi season and it’s a mighty little super fruit. 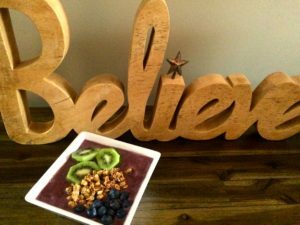 Use this as a favorite breakfast mix, pre-workout OR post-workout meal – you decide. Mix and match ingredients – that’s where the fun begins. Next time, I’ll probably add a frozen banana to add to that thickly smooth consistency. Chia, seeds, more fruit and coconut all sound pretty great too. And, I won’t take so many pictures. I’ll enjoy the bowl immediately. Post photo shoot bowls may call for a straw, not a spoon. Overall, I’m going to go ahead and say smoothie bowls win. I’ll work on the perfection details in the upcoming weeks. And, if you have already figured out this smoothie in-a-bowl trick, please [pretty please] name your favorite bowl in the comments. [I’ve never claimed to be a great cook or even like to spend time in the kitchen]. I think this almost like having ice cream for breakfast…? Yum! I love smoothies and smoothie bowls. Kiwis make a great addition! I always see these pretty little creations and I finally took the time to make one. And, then spent a little too long on the photo shoot. I’m going to have to make these every once in awhile. Ingredient thoughts?